When you are meeting your old friends back from uni, whom you haven't seen since you graduated, all you just catch up on is old common friends, habits and where you end up now. That was a huge topic that lasted for just 2 hours when I met up with a friend in Chelsea. We could have just sit there and chat more if our time would allow. It is really strange (in a good way) how people change, evolve and learn. Realizing, that just because you have studied one specific major, doesn't define your future and career path forever. I have actually realize this way sooner since I have moved to London. What matters after all is you doing what you are good at and enjoy. You keep learning everyday and the economics and market changes constantly. There are job positions and titles that haven't been here couple years ago. It is fascinating, yet so scary. Meeting up and catching up with some old friends remind me how much we have grown. How many ups and down we had in order to get to where we are. How much struggle and change is it since leaving the student life. 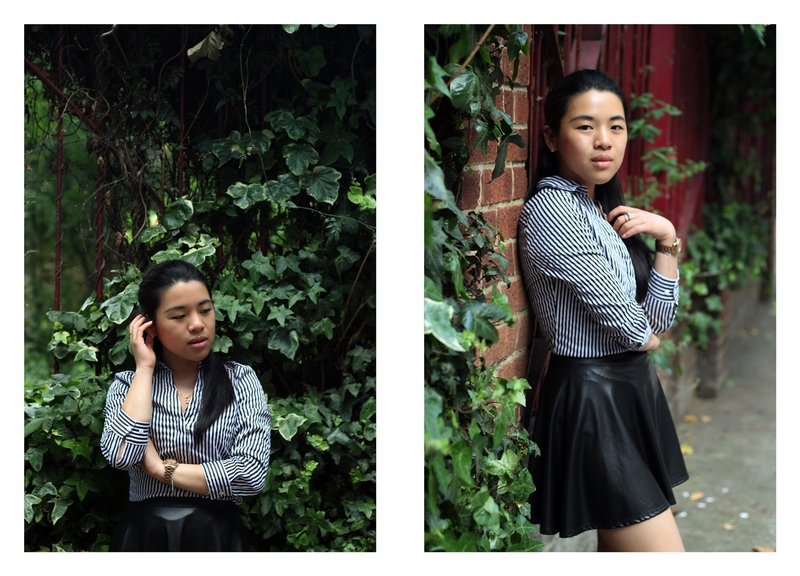 Wearing H&M striped formal shirt and Forever 21 faux leather A-line skirt.